Grand Rapids lost a giant yesterday. Former Mayor Lyman Parks died of complications accompanying a stroke. The community is poorer with his passing. Lyman Parks held office during an extraordinary period of our life as a community. He had been brought to Grand Rapids by the congregation of First AME Church with the charge to provide pastoral leadership to the members and to engage the church in a restorative way in the life of the community. He did both with amazing grace and presence. Within six years of arriving in Grand Rapids, Rev. Parks sought the permission of his congregation to run for City Commission. He was elected as the first African American to serve on the commission in 1967. When Mayor Robert Boelens left office in 1971 after less than two years as mayor, the city commission turned to Lyman Parks for leadership, appointing him to serve as mayor for the unexpired term of Mr. Boelens. At the end of that appointment Mayor Parks was formally elected to the office until 1975. Grand Rapids in those years looked nothing like it does today. Shops were vacant. There were few downtown restaurants and no downtown retail. When the workday was over, people left for their homes in the suburbs. Yet we had enjoyed a period of downtown growth under the Urban Renewal Act with new buildings on and around Vandenberg Plaza. The question was: What next? 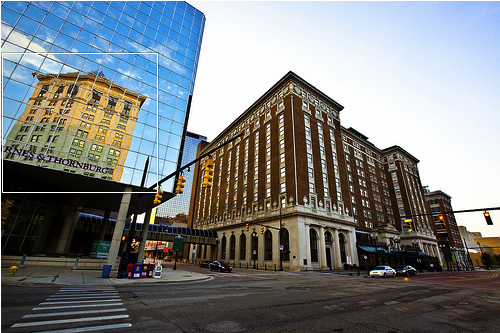 Mayor Parks appointed a blue ribbon committee to study and coordinate the future of downtown. 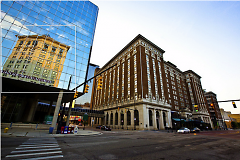 One of the remarkable outcomes of that work was the decision by Richard DeVos and Jay VanAndel to purchase and redevelop the Pantlind Hotel (today the Amway Grand Plaza Hotel). Arguably that investment – encouraged and assisted by the City under Lyman Parks’ leadership – launched the meteoric growth of downtown as a recreation and cultural destination for residents and convention-goers alike. Today downtown has become a residential destination as well, owing to the vitality spawned from that one early investment. Lyman Parks served as mayor during a time of great social upheaval. The nation was emerging from the race riots and Grand Rapids had experienced its share of racial unrest. Mayor Parks was the right man at the right time. His steady, pastoral presence calmed inflamed sensibilities. His remarkable ability to bridge communities of color and the majority community helped him lead us through a peaceful civil rights transition. We have Mayor Lyman Parks to thank for the way in which today we value diversity in community. In his last years I had come to know Mayor Parks as a friend and mentor. He was always willing to advise a rookie mayor on the best approach to a problem. I’ve lost a friend. The Parks family has lost a patriarch. The community has lost a leader.